Whoever builds the home, the best qualifications are that the person provide reliable, qualified subcontractors and that you feel comfortable communicating your needs. Most timber framers will cut the frame, deliver it to your site and raise it. At this point, some will continue to finish the home’s construction, while others will turn over the job to a contractor. Is there any advantage to doing it one way or the other? Not really. Some framers are excellent builders, particularly when it comes to finish work in a predominantly wood home. Others may not be as capable or move as fast as you’d like. Or you may be building your home far from your framer’s shop, and hiring a local builder may be more practical. Whoever builds the home, the best qualifications are that the person provide reliable, qualified subcontractors and that you feel comfortable communicating your needs. If you use a builder other than your framer, start by asking the framer for referrals. Always check out the references, and make sure the builder has all the licenses and appropriate insurance required by state and local laws. A builder doesn’t necessarily have to have experience finishing a timber home, although it certainly helps. Two of the main differences between completing a conventional home and a timber home that a builder will encounter are knowing where and how to hide the electrical wiring and plumbing lines in a home with very few walls on the main floor, and how to properly install the structural insulated panels that typically enclose the outer portion of the frame. 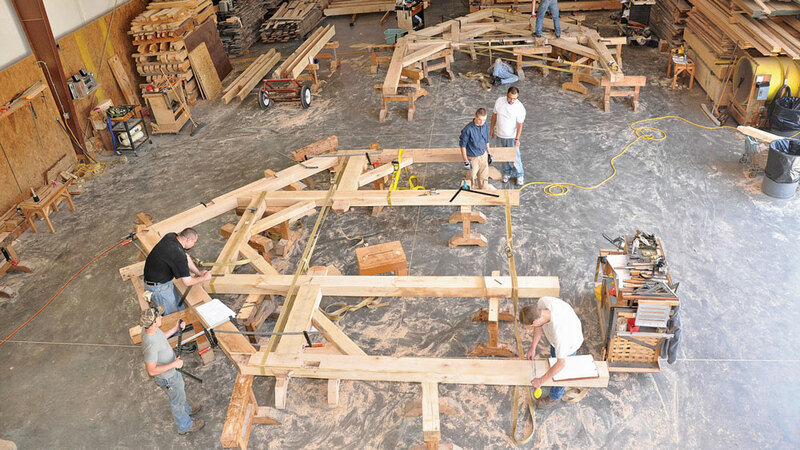 If the general contractor isn’t familiar with timber framing, many companies can arrange to have a technical assistant or a whole crew go to the site to coordinate the frame raising and panel installation. After the timber frame and panels are finished, the house is completed the same way as a conventional home.